Reliance Jio Infocomm added around 7.34 million customers in October, taking its market share past 12% while Bharti Airtel, Vodafone India and Idea Cellular registered comparatively modest customer gains of 3.14 million, 0.87 million and 0.71 million, respectively. Newcomer Jio continued its steady climb in terms of market share, taking it to 12.39%, up from 11.72% in September, 11.19% in August and 10.83% in July. Airtel though continues to remain India’s biggest phone company with 285.19-million customers, while Mukesh Ambani-led Jio’s customer base had grown to nearly 146 million at the end of October. Vodafone India and Idea’s customer base stood at 208.32 million and 190.86 million, respectively. 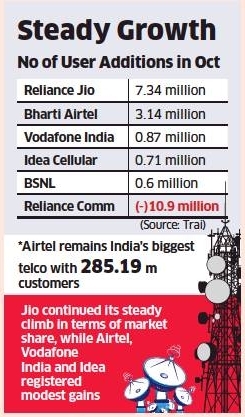 Trai’s data showed that Airtel, Vodafone India and Idea registered modest gains in market share to 24.21%, 17.68% and 16.20% from 23.84%, 17.53% and 16.07% in September, respectively. Reliance Communications lost over 10.9 million customers following its announcement in October that it would be shutting down its 2G and 3G wireless operations and run a non-mobile business. State-run BSNL reported 0.6 million customer additions in October, and its market share crept up to 9.03% from 8.94% in the previous month. 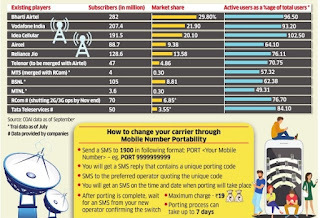 Visitor location register, a key metric reflecting the number of active subscribers on a mobile network, indicated that 98.09% of the users were active for Bharti Airtel, 94.11% for Vodafone India, 102.8% for Idea and 82.3% for Jio. Trai data showed that the total base of phone subscribers fell to 1,201.72 million in end-October from 1,206.71 million in end-September, reflecting a 0.41% dip.